In this work, we consider the popular P1–RT0–P0 discretization of the three-field formulation of Biot's consolidation problem. Since this finite-element formulation is not uniformly stable with respect to the physical parameters, several issues arise in numerical simulations. For example, when the permeability is small with respect to the mesh size, volumetric locking may occur. To alleviate such problems, we consider a well-known stabilization technique with face bubble functions. We then design a perturbation of the bilinear form, which allows for local elimination of the bubble functions. 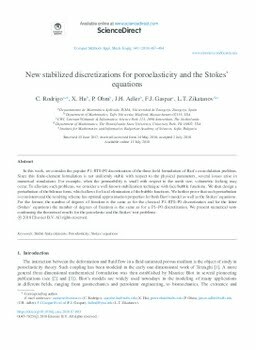 We further prove that such perturbation is consistent and the resulting scheme has optimal approximation properties for both Biot's model as well as the Stokes’ equations. For the former, the number of degrees of freedom is the same as for the classical P1–RT0–P0 discretization and for the latter (Stokes’ equations) the number of degrees of freedom is the same as for a P1–P0 discretization. We present numerical tests confirming the theoretical results for the poroelastic and the Stokes’ test problems.